Since 2001, when the drafting of Constitutional Framework for Provisional Institutions of SelfGovernment began, there has been an ongoing debate regarding the electoral system in Kosovo. However, local actors have had little impact on this debate. It can be said that this debate among the political elites and civil society in Kosovo has been limited within the framework set by international actors, who from the beginning were determined in favour of the proportional system (PR) with the over-representation of minority communities through reserved seats. 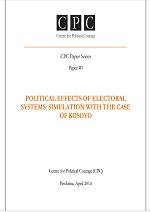 On the other side, the debate among internationals about the type of the electoral system in Kosovo during 2000-2001 has been substantial and included the analysis of the appropriateness of other electoral systems, especially of the Single Member Plurality (SMP) system. However, the local political actors were not included in this debate, since it was conducted exclusively among the internationals.